Earlier this week Nicole Richie was spotted out and about wearing a long bohemian skirt This skirt is by Dries Von Noten, it is a Bohemian style skirt that has a multicolored print throughout, tie wrap closure, and detailed pleating throughout. The skirt ties around the waist and is slightly sheer with an unfinished bottom hemline. 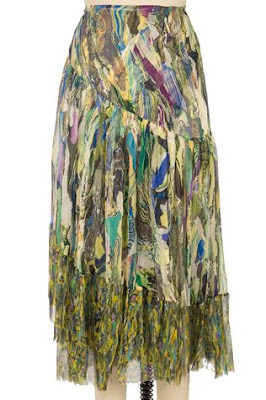 The skirt was $1605 and is now reduced to $802! Click here to purchase Nicole Richie's fabulous flowing skirt from Ron Herman!